On our last full day in Barcelona we wanted to see everything we had missed so far. A tall order. On our first day we had explored the fabulous Sagrada Familia. On our second day we took a side trip to Figueres to check out the Dali Museum. So we started our third day with a visit to Gaudi’s other masterpiece, the Parc Güell. We hopped a metro to the Plaça des Lesseps station which is just a fifteen minute walk from the park. Visitors are warned to beware of pickpockets in Barcelona and we encountered one on leaving the station. I was walking up the steps on the right side holding onto the handrail when a young guy came up quickly behind me and tried to barge his way between me and the handrail, but my friend warned me and I held my ground. He went up the stairs empty-handed. When we got to the top I pointed at him and shouted out a warning, “Watch out! That man is a pickpocket.” He gave me an angry scowl and slunk back down into the train station. The fifteen minute walk took us through some narrow streets and up a fairly steep hill which did have an escalator. When we emerged, there was the elevated plaza that is the centrepiece of the park. Our first view of the Parc Guell. Our route took us right to the top of the plaza. Parc Güell was conceived as a housing development by banker Eusebi Güell. 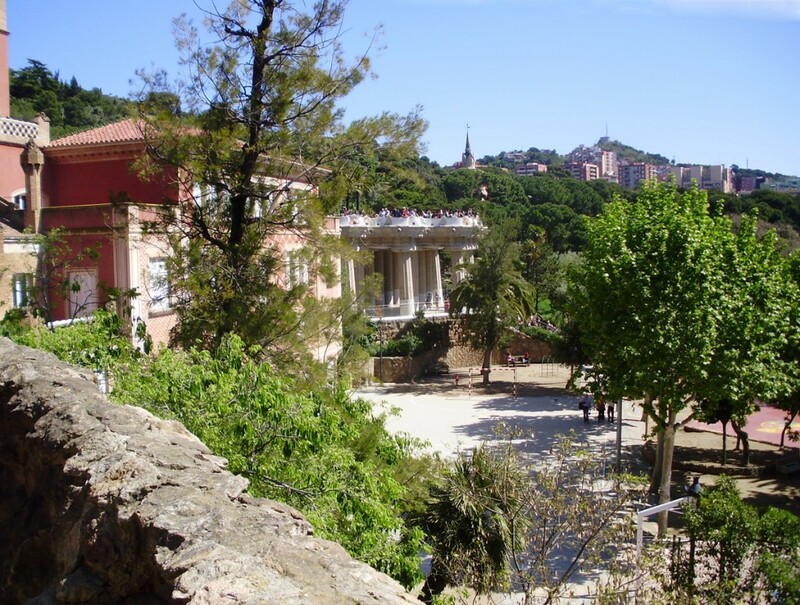 He had acquired a large plot of land on Carmel Hill and commissioned Antoni Gaudi to design the development which was to have sixty upscale houses. 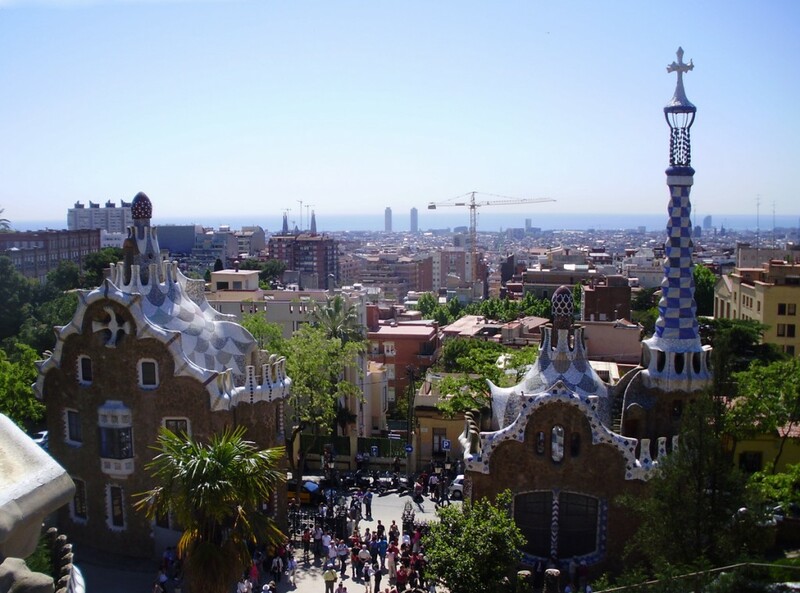 Work on the project started in 1900 and continued through 1914 but a variety of factors – complex leaseholds, lack of transportation, and the exclusive nature of the project – doomed the project to failure and only two houses were built, neither designed by Gaudi. The upper terrace on its 84 Doric columns and edged by the wave bench. 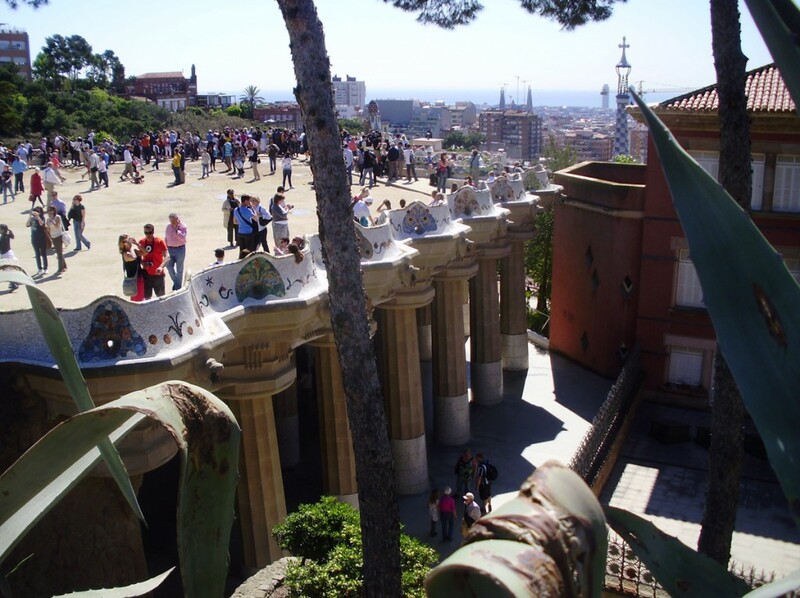 What Gaudi did build was the central terrace, supported by 84 Doric columns, as well as the central staircase leading to the lower terrace. And at the base of the staircase, two buildings – a porter’s lodge and an office (now called the Warden’s House) are pure Gaudi, built when he was at the height of his creative powers. 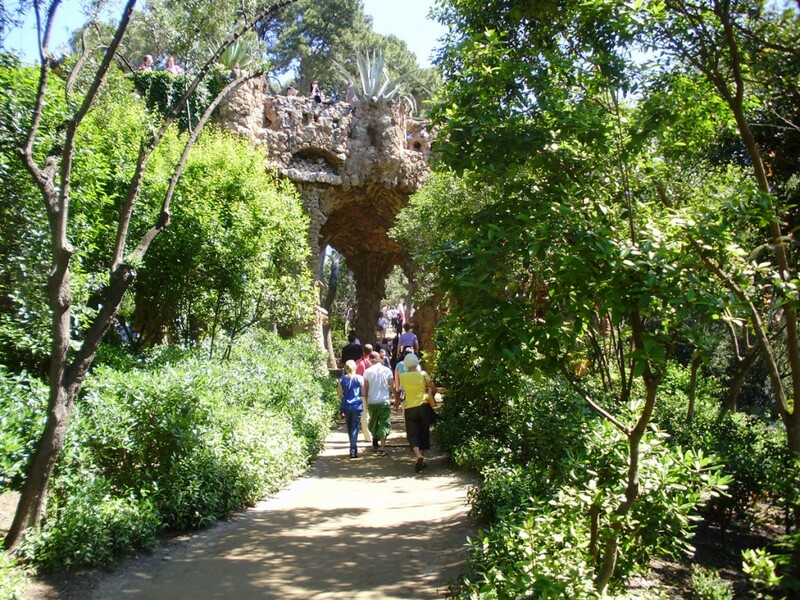 And so were several viaducts, created in Gaudi’s distinctive organic style. The Warden’s House, originally designed to hold offices, and the Porter’s Lodge, both built by Gaudi as part of the entrance area of the park. The two spires above the apartment building to the left in the background are the Sagrada Familia, another of Gaudi’s master works. 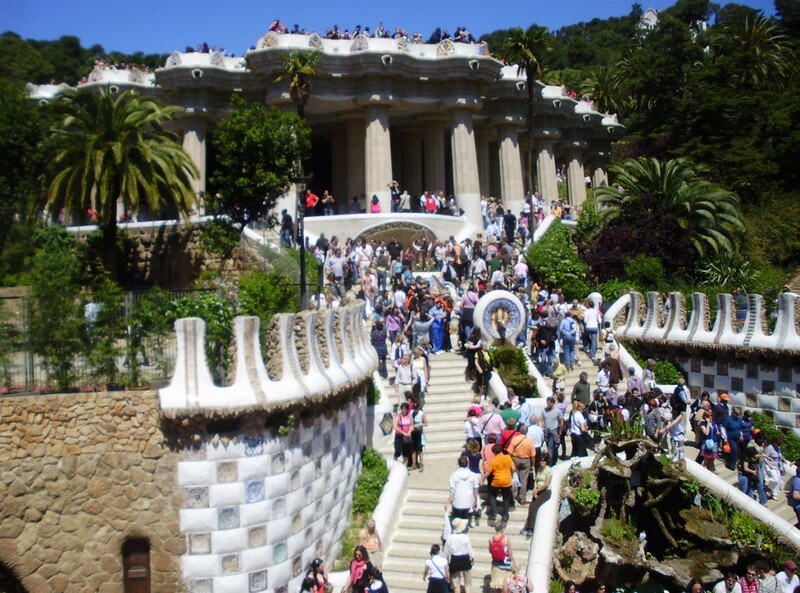 Güell died in 1918 and his heirs sold the property to the city. It opened as a municipal park in 1926. The terrace is bordered by a long serpentine bench, sometimes called the wave bench. Like many of Gaudi’s works from this time, the bench is inlaid with colourful tiles. The upper terrace commands a brilliant view of the city and the Mediterranean in the distance. Looking down from the terrace, you also see the Porter’s Lodge and the Warden’s House, both also richly covered in mozaic tiles and reflecting Gaudi’s naturalist style – lots of curves. 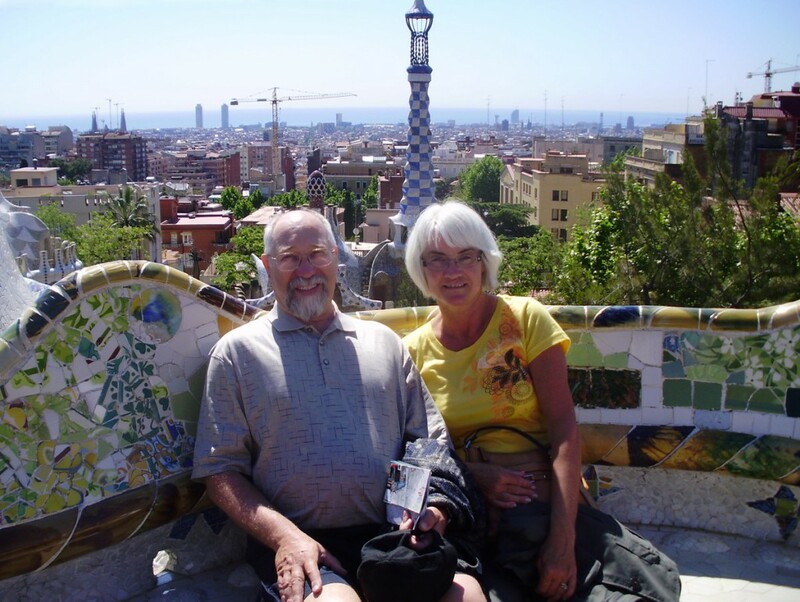 Janis and I on the wave bench at Parc Güell, the spire of the Porter’s Lodge behind us. 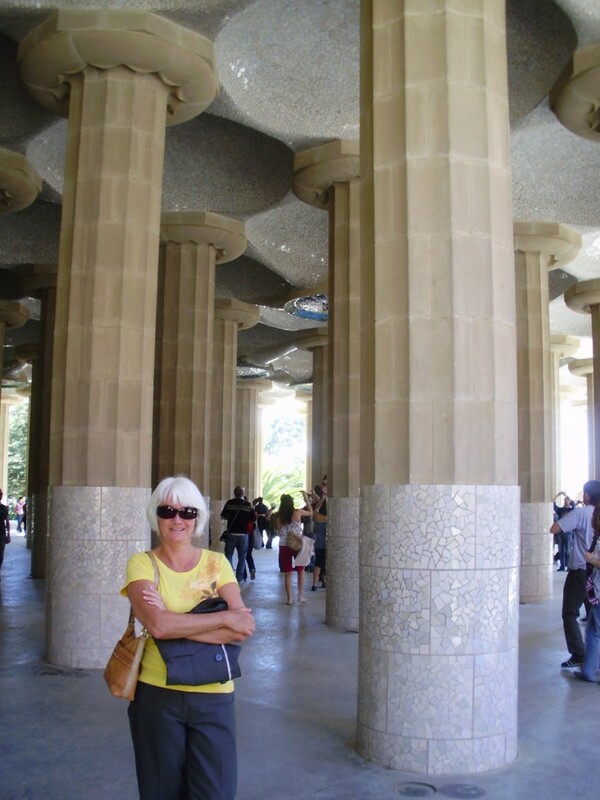 We descended to the lower terrace and marvelled at the mozaic ceiling between the columns supporting the terrace. The lower terrace itself is often frequented by buskers providing some entertainment for the many visitors. Janis on the lower terrace. 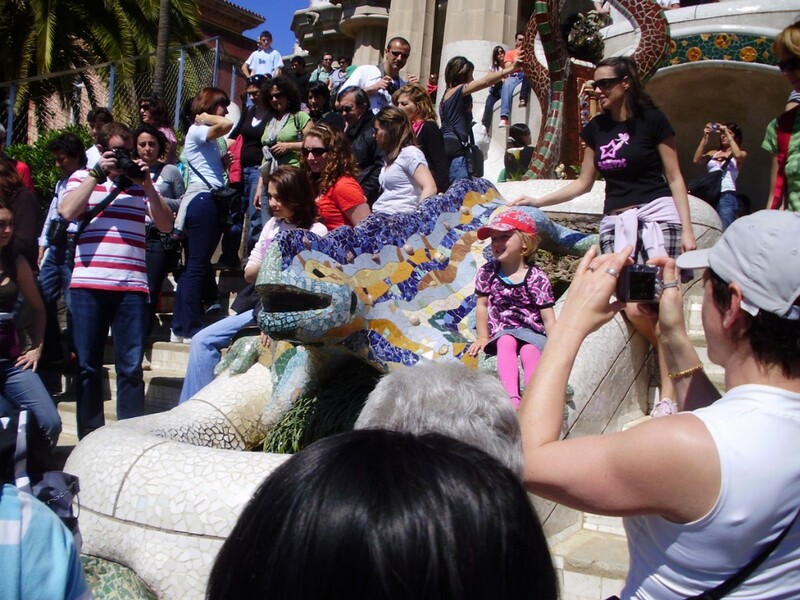 From the lower terrace we walked down the sweeping staircases and admired the giant mozaic salamander that is the centrepiece and a hallmark of Gaudi’s style. The giant mozaic slamander. We were there on a Saturday and it was very busy – a very popular place with locals as well as tourists. We then followed a path underneath one of the viaducts. These large structures were quite different in style than the buildings and terrace. The supports and decorative elements were more reminiscent of the Sagrada Familia – a tawny jumble of stonework just piled together. No smooth lines except in the aggregate. Graceful and delicate looking despite the rough hewn edge. Along a path taking us beneath one of the viaducts. Beneath the viaduct we came across another busker playing his instrument, and the path then took us past the Casa Museu Gaudi. 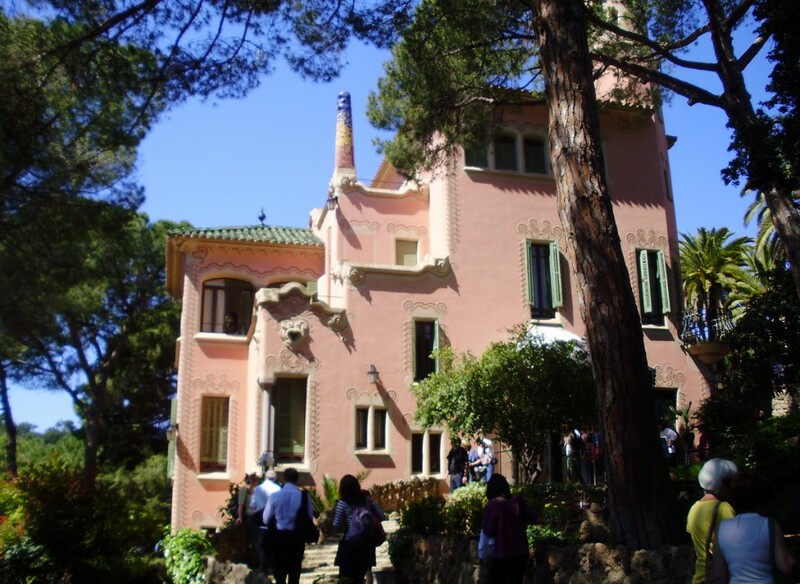 This house was built as a show home for the Park Güell residential project by by Gaudi’s right hand man, Francesc d’Assís Berenguer i Mestres and Gaudi lived there from 1906-1925. 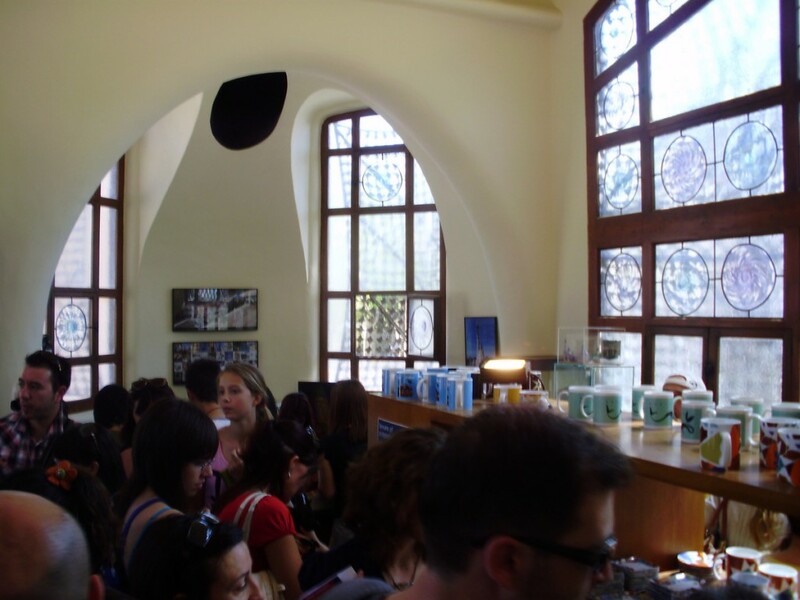 It is now a museum dedicated to Gaudi and his works. We did not tour the museum. We then walked over the viaduct and back down to the Porter’s Lodge which is open to the public as a gift shop. Inside we found curved spaces everywhere. Gaudi was fond of curves and used them to good advantage. A narrow winding staircase took us upstairs. From the windows we caught a good view of the sweeping stairs leading up to the terrace. On leaving the gift shop we came across another busker playing in one of the grottos at the base of the staircase. It was an interesting instrument, both percussion and stringed. He hammered at the strings with mallets creating a very pleasant sound. 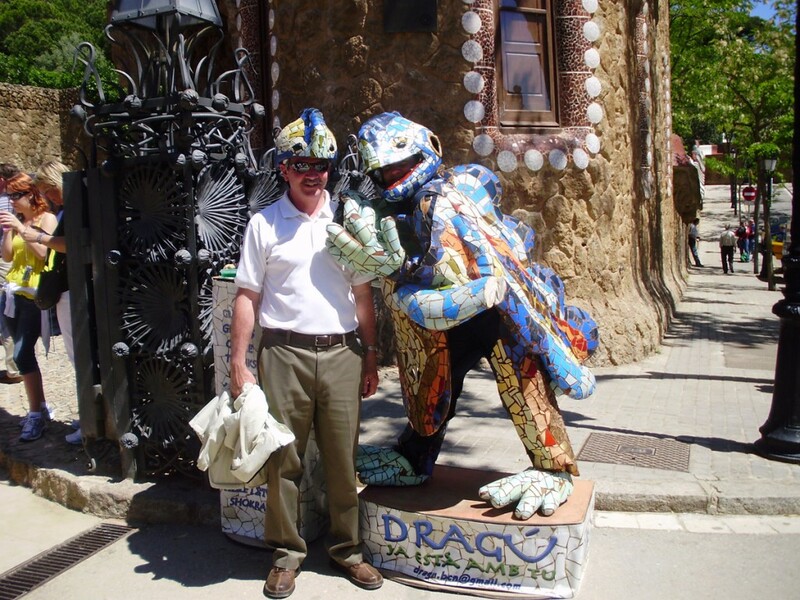 As we were about to leave Parc Güell we came across someone in a salamander costume. He had a helmet to match which you could wear to pose for pictures with the man. For a modest fee, of course! We had an enjoyable tour of this popular venue and still had time for more. But the wives and the men had different ideas of fun. So while our wives went shopping, Chris and I jumped aboard the Hop On Hop Off bus and took a last tour of Barcelona. We arranged to meet up with the ladies in the late afternoon at the statue of Christopher Columbus on the waterfront, after which we would explore another must-see Barcelona venue, La Rambla. And that will be the subject of my next post! 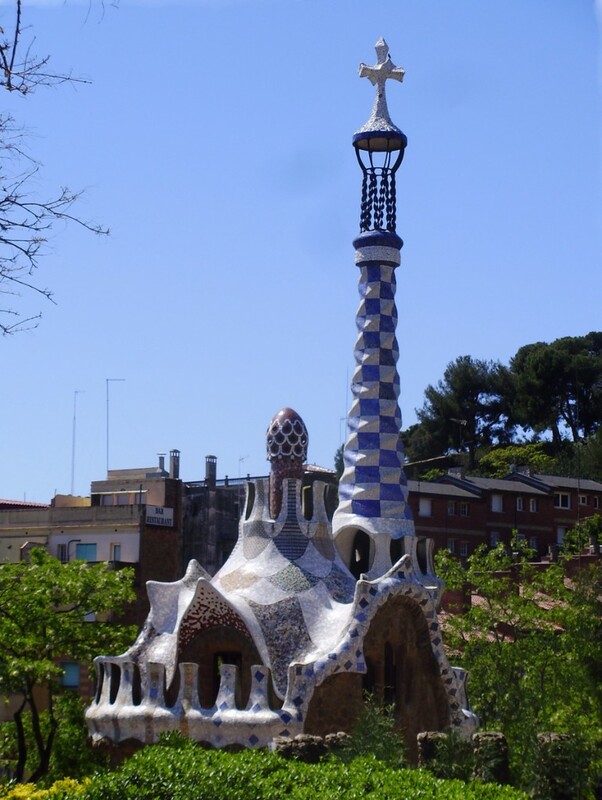 Please click on the link below to see an additional photo gallery of the Parc Güell or if you are on the main page, just scroll down. 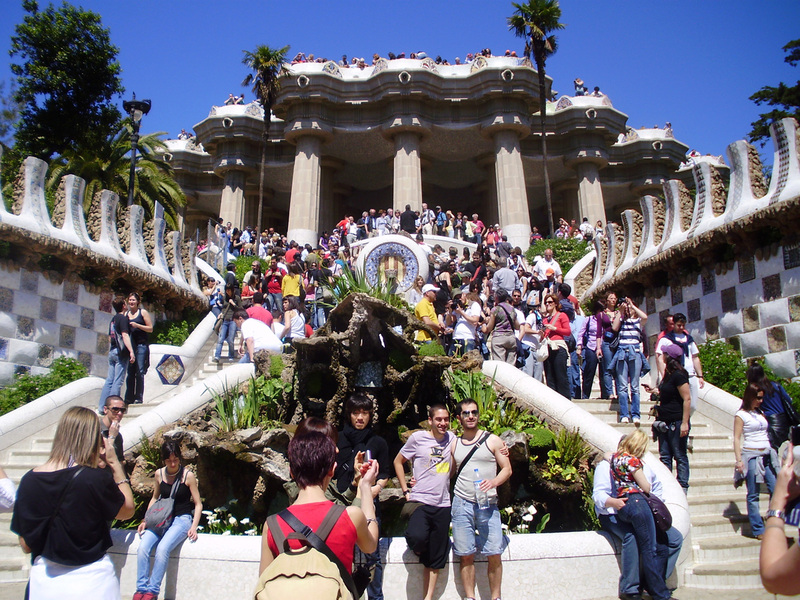 I’ve included links to official websites for the park and for the Gaudi House Museum.